Cucumbers are 95% water so they have a hydrating effect. 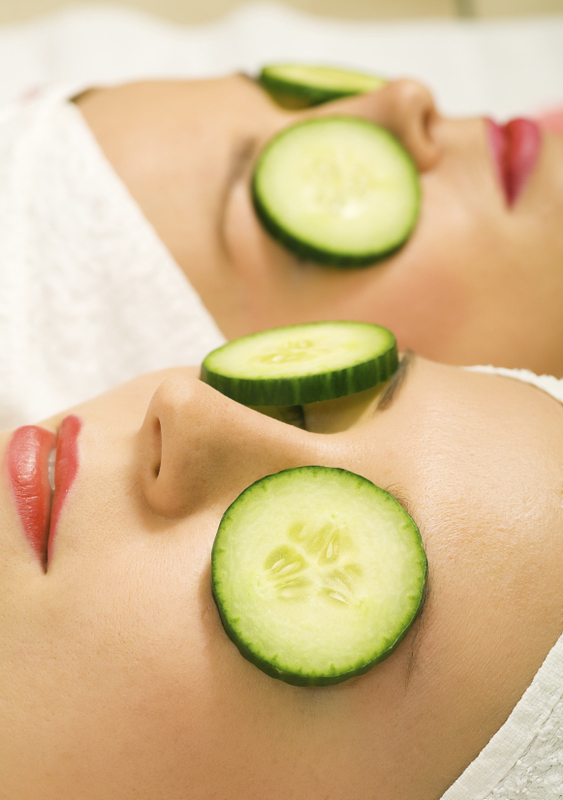 They help get rid of the bags and puffiness beneath and around the eyes and flush out toxins. Cukes contain vitamin A, vitamin B and vitamin C, which strengthen the immune system. They add bulk and fiber to whatever you’re eating, so you fill up, but don’t pile up the calories. When I’m cooking, I keep cucumber sticks nearby to snack on (especially if I’m preparing a dessert recipe). Cucumbers are available all year. But they’re in season now, so if you buy locally grown produce, the cucumbers you’ll find in the market will be crisp and amazingly refreshing. In the farmers’ market, you might come across yellow cucumbers. Cucumbers that are yellow are usually a bad thing… unless you’ve stumbled upon a lemon cucumber. 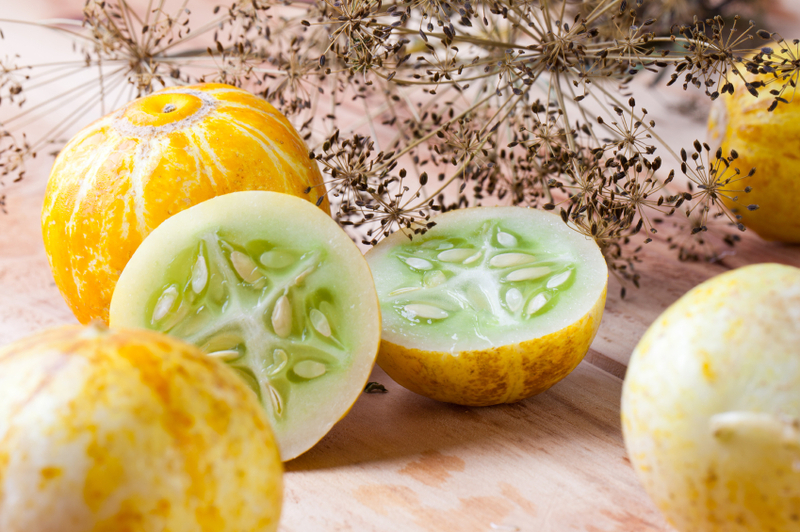 These cukes are about the size and color of a lemon (no… really? ), the skin is thin and the flesh is juicy and bright green with large seeds. They can be eaten just like any other cucumber. Most cucumbers that we find in supermarkets have been coated in an edible FDA-approved wax to protect the skin and prolong the vegetable’s life. You’ll know the cucumber has been waxed if you run your thumbnail lightly down the side and you see a bit of waxy residue. You can eat the cucumber with the peel on, but scrub it first! Hothouse-grown English cucumbers are long and skinny, and they usually come wrapped in plastic because they have not been treated with wax. No need to peel or remove the seeds with these cukes! 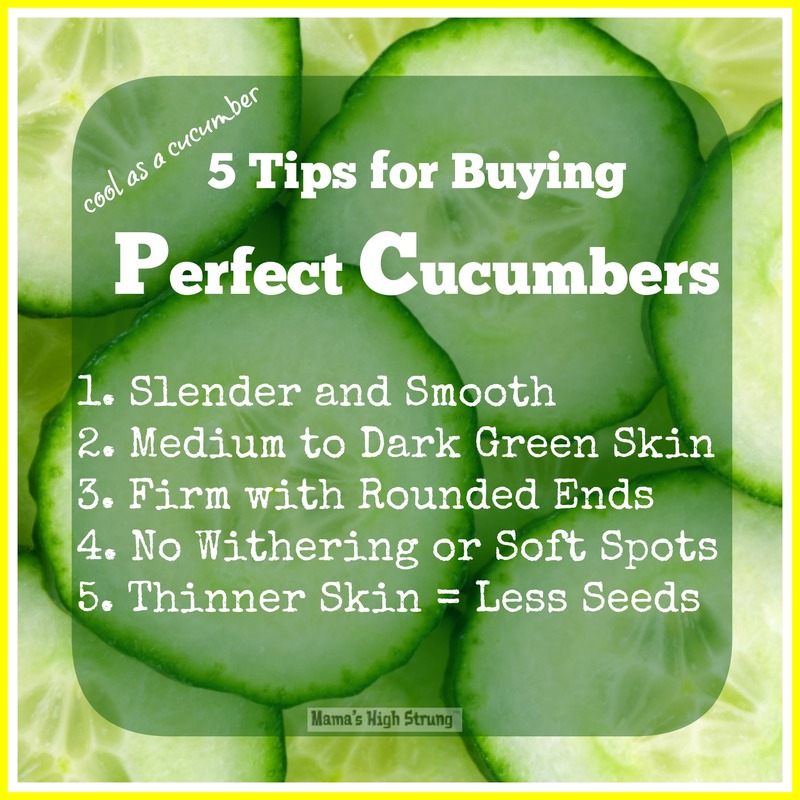 I’ve pulled together 5 tips for picking perfect cucumbers, to help you pick the best of the season! Makes cucumber ribbons by peeling a whole cucumber, then peeling the flesh lengthwise off the cucumber. Peel and cut a cucumber lengthwise. Remove seeds and fill each half with flavored cream cheese. Put the halves back together, chill, and slice into rounds. Peel a cucumber then cut into ½-inch pieces. “Dry” on a paper towel for 10-mintes and then use a “chip” for hummus or guacamole. Always like meeting and reading new blogs! I really needed this! A bad cucumber is really, really bad. Thick skin, bitter, yuck!! So, I needed some more info. Plus, I am not on the lookout for a lemon cucumber. Looks delish!! Thanks for educating me! You are welcome. I bought cucumbers that were soft on the ends for the longest time… they don’t last as long obviously! Thanks for stopping by. I love dipping cukes into hummus. Your cucumbers will be mega delish because they won’t have that yucky wax on them. Thanks for stopping by!